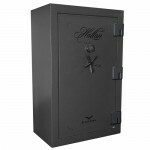 The Black Hawk Gun Safe offers strength in design and quality. 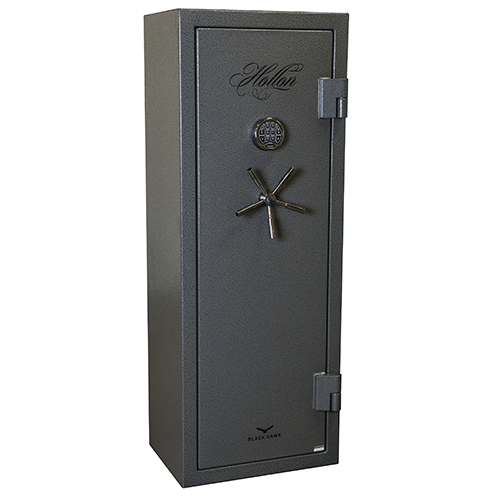 It is designed with 10 gauge steel and an additional ¼ inch steel plate on the interior of the door giving this safe 30% thicker steel than most competing brands. 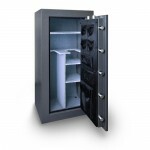 In addition to thicker steel the door is 5 inches thick overall. 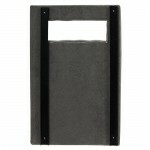 This creates a barrier that withstands both crow bar and pry bar attack. Each safe is reinforced with up to 16 solid steel bolts at 1.5 inches thick. 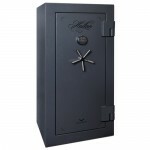 That’s thicker and longer than the industry standard for high security gun safes! 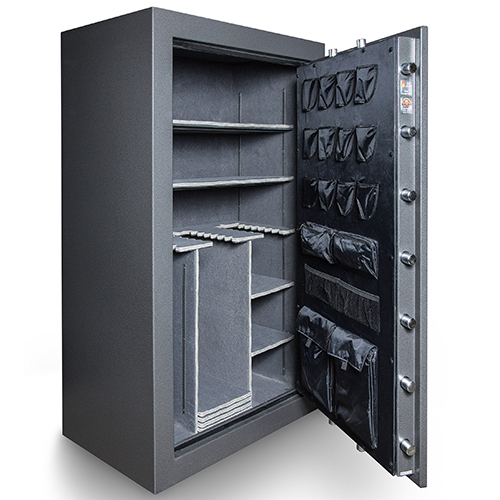 Furthermore, our bolts are placed on all four sides ensuring maximum defensive protection to keep your firearms safe from theft. 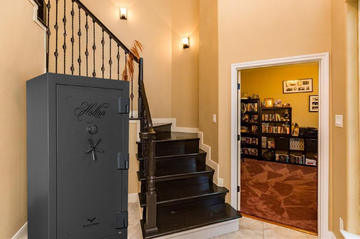 The hinges are a high security vault style hinge that is designed to outlast standard gun safe hinges by decades. 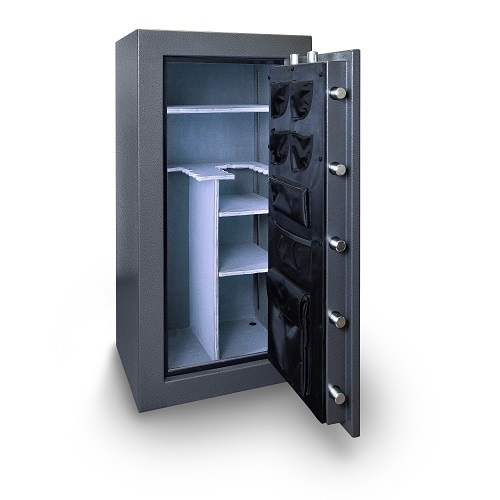 Our vault style hinge allows for complete fire coverage of the interior hinge where others that use interior hinges don’t bother to put insulation. 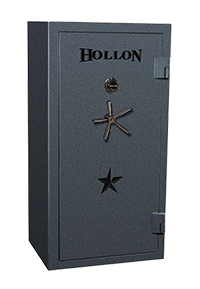 Our Black Hawk Gun Safe now has an increased fire rating of 90 minutes at 1400 degrees. We use multiple layers of fireboard with each layer sealed, caulked, and filled with fire resistant caulking. 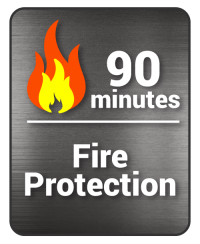 Additionally our intumescent door seal expands to 8 times its original size when exposed to heat. 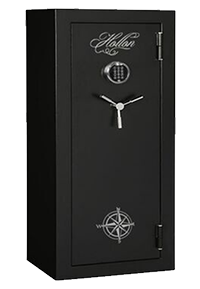 We use only the Sargent and Greenleaf Military Grade EMP Rated Spartan lock. 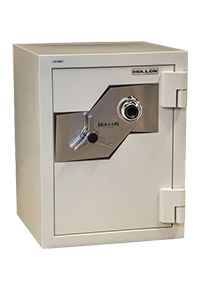 It is a UL listed Type 1 Electronic Lock designed to withstand 1,000 newtons of bolt end pressure to resist side punch attacks. The red LED light illuminates the keypad for easy access even in dark rooms. 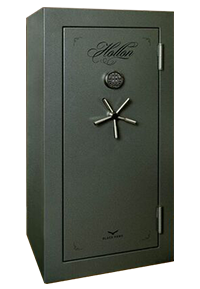 Every Black Hawk Gun Safe comes standard with drill and ballistic resistant hard plate to protect the lock during drill attacks. The only practical way through it is by melting it. 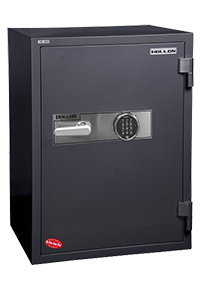 If a thief were to get through that we have a dual relocking system that works even if there is no lock left on the safe. Luxury features include a 5 spoke black chrome handle and trim. A plush cushioned interior is wrapped on all sides and includes our special durable “pillow trim.” This design coddles your guns and eliminates possible scratches. 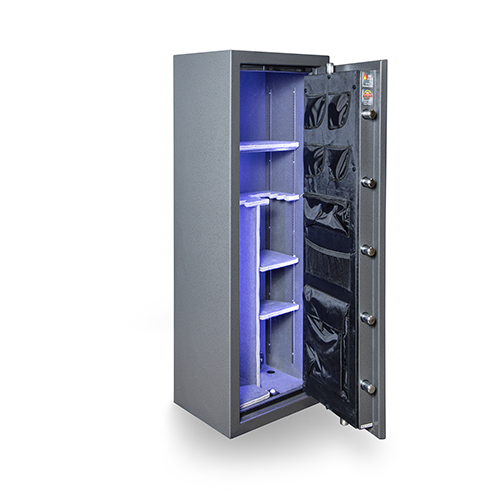 In addition to our luxury interior each Black Hawk Gun Safe includes our motion activated “Vista Light” LED lighting system. It can be either battery operated or plugged into the UL listed electrical outlet that includes multiple outlets and two USB ports. Included on each door is our heavy duty canvas door organizer designed to help you get the most usage of space. 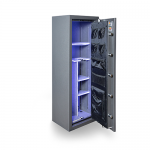 Our Multi-flex shelving system allows for different arrangements for maximum use of space including tactical set ups. Every Black Hawk Gun Safe comes with 4 bolt down holes and hardware. 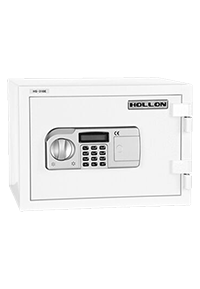 Why does Hollon Safe use the more expensive S&G electronic locks over the imports that other brands use? 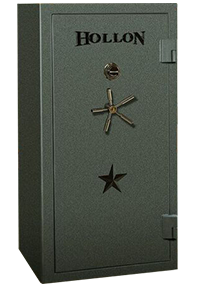 Sargent and Greenleaf’s high-security electronic locks are proven to withstand military-level EMP attacks giving you full access to your valuables even after an EMP emergency. S&G tested its most popular gun safe locks using the U.S. military’s highest EMP impact standard. An independent lab applied a radiant transient electromagnetic field on a variety of S&G keypads following the Military Standard MIL-STD461F, Method RS105 at 50 kV/m peak exposure. 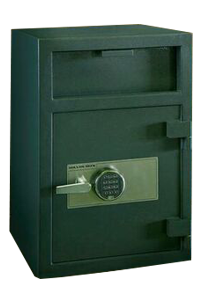 At the end of the testing series the S&G locks were still fully functional. Electromagnetic pulses (EMP) are short bursts of electromagnetic energy that can interfere or damage electrical equipment, thus disabling their functionality. An EMP can occur naturally with solar flares or can be created by technological devices such as nuclear weapons. The high-energy particles from such an explosion would cascade down to Earth interacting with the planet’s magnetic field and destroy the electronic systems below. This would cripple the nation’s power system. Now Includes “Vista Light Kit” motion sensative, battery or electrical. $150 upgrade value.